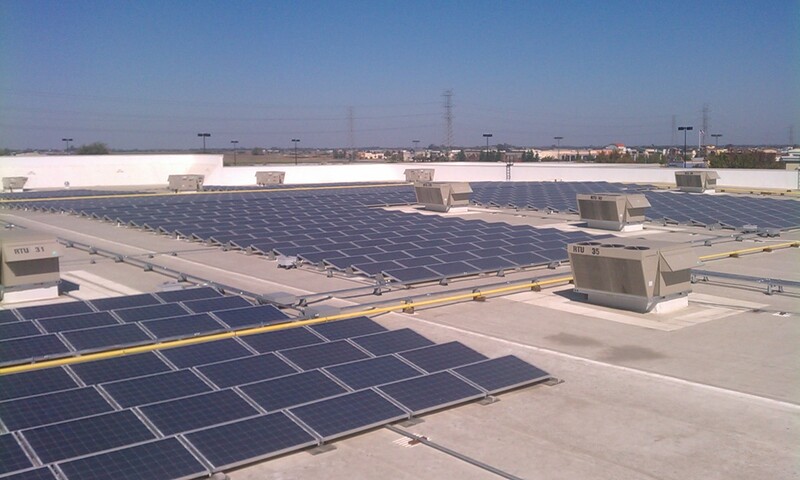 Walmart FresnoBarnum & Celillo Electric, Inc.
Perched high atop the Walmart Fresno, CA Supercenter, lies a 600 kilowatt solar system that was recently installed as part of a collaboration between Barnum & Celillo Electric, SolarCity and Walmart. Barnum and Celillo Electric, Inc. and SolarCity’s relationship through the years has produced many successful solar installations bringing our country closer to its renewable energy goals. When Walmart partnered with SolarCity to unveil their renewable energy portfolio, SolarCity knew who to turn to in order to meet Walmart’s high expectations. With solar installations at over 350 stores nationwide, Walmart has committed to having 7 billion watts of solar power installed on their facilities globally by the end of 2020. At Barnum & Celillo Electric we are glad to be part of such high aspirations and proud to have earned the trust of these two companies.